What I love about the concept is how well-timed it is. The hacker collective known as Anonymous has made multiple headlines in recent years as willing to go above and beyond to expose those in power who abuse that power. But its also not all good stuff as Anonymous has also done some really unethical stuff. But the power of a group of hackers who know what the hell they are doing can’t be ignored. And you can’t ignore the fact that in a way, these hackers are also activists, just of a different kind than we might imagine. And there’s the whole concept of the Arab Spring, which has really become the global social news event of the century. We also can’t ignore the fact that the Arab Spring was so successful in part because of the power of social media, with the inherent global reach. So really, Alyssa Milano and Archaia have timed this book perfectly. The main protagonists here are two hackers who recently caused a social media revolution with a new platform that goes above and beyond what either Facebook or Twitter or Google+ or others can do. Six hundred million users is pretty damn huge. Young entrepreneurs, they’ve converted their public success into private success by also enabling social change in Tunisia. And in that sense, I love the whole idea behind this book. It sets up a lot of great character drama that I can really get invested in for a good long while. The pacing of the story in the first issue is inconsistent and sometimes the dialogue is a bit hard to follow as well, but if we put that aside, we have a story that is well-told. Recasting the social changes of our everyday lives into something worthwhile, such as we did see with Arab Spring, and what is mirrored here in the comic itself, is a great move by Alyssa and the two writers. Honestly, I think the idea has tons of potential. And I can’t wait to see what happens next. The issue ends on a really interesting cliffhanger, something that was quite unexpected, and in that, the writers succeeded in turning the tables on the reader, which is always a huge plus. That kind of a twist is not easy to set up, especially not with a story involving hackers. With the art, we have Marcus To on the pencils with Ian Herring on the colours and Deron Bennett on the letters. The art isn’t really all that remarkable but it gets the job done and all the characters and scenes are drawn well too. I don’t really have any complaints about the artwork. In a standout moment, we get to see how the interface for YourLife, the social network presented in the comic, looks like and how an influential user like Nick Graft, the aforementioned co-owner of YourLife, can affect things with a simple message. The message certainly does not need any verbal translation. The art does all the work there quite beautifully. So overall, a good first issue. 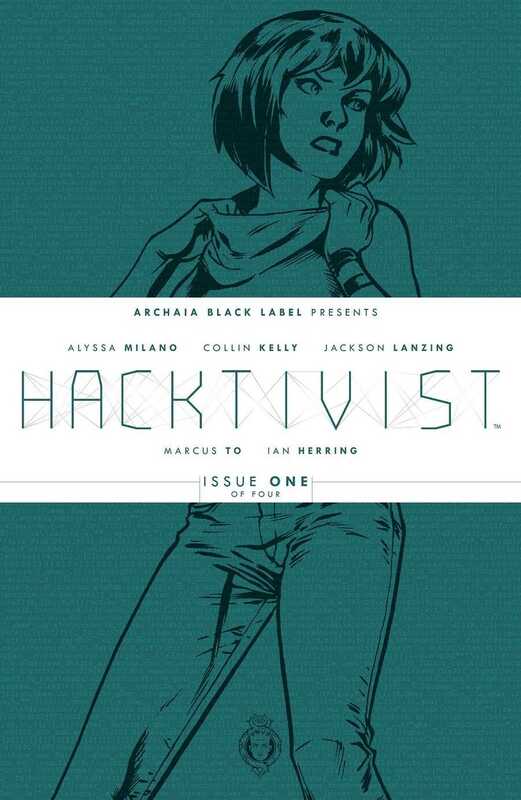 Posted on January 25, 2014, in Comics Reviews, Review Central and tagged Activism, Alyssa Milano, Archaia Black Label, Collin Kelly, Comics, Comics Review, Deron Bennett, Hackers, Hacktivist, Ian Herring, Jackson Lanzing, Marcus To, Review, Review Central, Revolution, Social Media, Social Network. Bookmark the permalink. 4 Comments.